MDK2 is a video game and sequel to the third-person shooter, MDK. The original MDK was developed by Shiny Entertainment and released in 1997 by Interplay. The sequel was developed by BioWare. 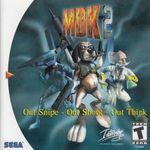 MDK2 was originally released for the Dreamcast and PC in 2000. It was later revised and released for the PlayStation 2 as MDK2: Armageddon. The main difference between the Dreamcast and the other two versions is the ability to select the difficulty level. A remake of this game has also been announced for Nintendo's WiiWare service and is scheduled for a release in early 2011. Source: Wikipedia, "http://en.wikipedia.org/wiki/MDK2," available under the CC-BY-SA License.